Badura-Skoda's early recordings for Westminster - solo, duos with Jörg Demus, chamber, concertos - included some very fine performances. That's what this set appears to include; DG had nothing to do with it. Later I think he lost some freshness and spontaneity without a compensating gain in depth. He also wrote the best cadenza for Mozart's concerto #22; you may have heard others play it. 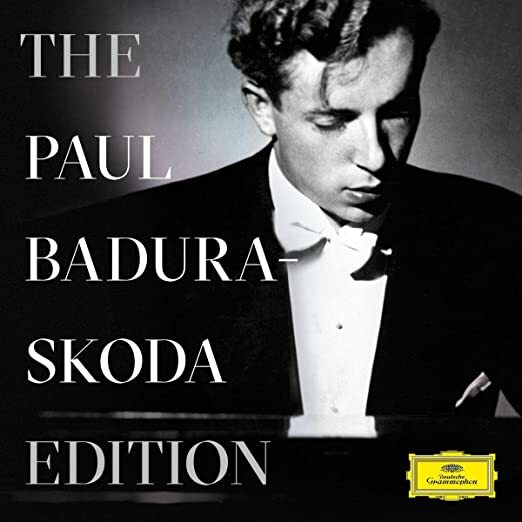 Badura-Skoda's own recording of the 1950s, in which he also conducts the so-called Vienna Konzerthaus Orchestra (I'm guessing members of the Vienna Symphony), is not on YouTube; I think it's excellent, not just for the piano playing but because he got the balances with the all-important woodwinds just right. In those sessions he also recorded the concertos #14, 19 and 24. YouTube has the first movement of #24, not as striking as his #22 but a fair sample of his style. The cadenza is his own. There's a Badura-Skoda No. 22 on YouTube with Furtwängler conducting, but it's slower, somewhat heavier, and with less clear sound, so I haven't linked to it here. DG, current owner of the Westminster catalog, has a lot of skin in the game. I have been pleased with their previous reissues of Scherchen, Rodzinski & Sills from that storied independent label. I haven't been able to find a TOC for this box but these would likely be PBS's classic, pre-HIP recordings and well worth hearing if the price is right. Badura-Skoda is excellent in the mainstream Central-European classics: Mozart, Schubert, Beethoven, Haydn, etc. I own a lot of PBS on Westminster & RCA LP and have never been disappointed. I am expecting this set at any time now and am looking forward to it. I well remember Badura-Skoda's Westminster LPs and have many of them. This is a wide-ranging collection of his work mostly from his earliest to middle periods. 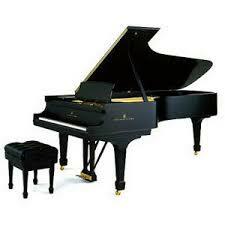 Westminster often gave their pianists some of the finest piano sound I've heard on recordings. DG, current owner of the Westminster catalog, has a lot of skin in the game. I have no idea at all what that means. Probably means monetary investment in their Westminster acquisition, and doing all the remastering. Looking at what's included, the output is massive. Almost certainly they picked up the enormous Westminster backlist for next to nothing from whoever was selling it. Whatever, they didn't put a dime into actually producing any of these recordings. Billing them as DG recordings takes some nerve and banks on the ignorance of the public. It is tantamount to what Warner Classics has done with all their acquired labels. Apparently due to their buyout of EMI, that logo cannot be used on their products though I do see the name Parlophone on technical details. So all of Callas and the myriad EMI artists fall under the Warner name exclusively now. Universal has done the same in issuing Philips and other recordings under the Decca or DGG names. As you say, there is no reference to the famous Westminster name in details except it may appear in the booklet texts at times. Who would ever have that all these mergers would have happened. Sony taking on Columbia/CBS and RCA, though I note the RCA logo does appear on their reissues of original RCA recordings. I have several Westminster recordings by Scherchen and Rodzinski reissued earlier by DG with the Westminster name or logo displayed prominently on the packaging. There is also DG's 40-disc compilation of Westminster recordings with crystal-clear attributions to the source material. Not all outfits are that upfront, cf. Naxos's Collins or Delos reissues, and maybe DG did drop the ball with their new PBS 90th Birthday Tribute mega box. But if this set's acquisition, remastering, design, production and marketing have suddenly become cost-free, that would indeed be cause for celebration, 'cuz it ain't gonna sell that many copies. Yes, I have seen DGG display the Westminster logo at times, but not on a regular basis. They have nothing to fear anyway ... those who want any of these recordings are delighted to have them in CD form now. Besides, the Westminster label did much to bring fine music and artists to recordings and they are nothing to be ashamed of in any way. A lot of us "oldsters" grew up with Paul Badura-Skoda; I'm sure the younger set will not know his name to well. On the other hand, so much music (yes, mostly in mono sound) for such a reasonable cost for generally outstanding recordings and substantial repertoire, you really don't think this set will sell well? "Trust but verify," Ronald Reagan said, so I finally took a peek at the back cover of the Badura-Skoda box printed above. There DG explicitly describes its PBS offerings as originating with 1950-65 Westminster recordings. So much for the notion that DG issued it with intent to deceive. I don't think this set will sell well in the US (maybe in Japan, Korea and China though) and hope I am wrong in thinking that DG is willing to eat the production costs in tribute to Badura-Skoda, but if I see the set at a good price, I will surely buy it. I like listening to Viennese pianists: Wuehrer, Klien, Brendel, Demus, Haebler, Gulda et al. Some folks now consider those old Westminster mono originals to be audiophile recordings! Sony Korea came out with two massive boxes compiling orchestral and chamber Westminsters from that era and DG put out a Westminster megaset of its own. Maybe the most popular of the DG issues of Westminster material were the Beverly Sills Donizetti and Offenbach operas from Westminster/ABC originals. I was grateful to get these on CD instead of inferior LP pressings, and if memory serves, DG also identified them as coming from Westminster. IIRC, Westminster was "absorbed" by DGG back in the late 1990's, partly because there was such widespread demand for the Beverly Sills recordings of the Donizatti "3 Queens" operas. Though they sold well, I never thought that Sills's voice was suited to those roles, and indeed, she went into vocal decline after performing them, much as Renata Scotto did after recording Verdi's Nabucco (Abigaille) with Muti. Thus, I'm glad to see Badura-Skoda finally available, at any rate. I was never all that enamoured of Sill's voice, though I certainly recognized her impeccable musicianship. I have collected her recordings with interest, nonetheless. And me, too, glad to see the Badura-Skoda issue. I am getting impatient to get my copy, in fact. QTD ---> Badura-Skoda is still playing - On Oct 15 this Sunday at the Musikverein in Vienna he will be playing Beethoven's last 3 sonatas as a birthday concert - Gramola unfortunately is not recording it. By the way, records indicate my Badura-Skoda set was DELIVERED on October 4th. As of yet, I have not seen it and that is over a week ago! Along with it was his traversal of Schubert's piano sonatas on RCA. Sounds like a mis-delivery to me!!! Wow! I had that happen to me twice with amazon, and I live in a doorman building in Manhattan! I must say that I waited 2 weeks from the supposed "delivery" date, and wrote amazon an email: they credited my account immediately for both items. Same here. Full cost immediately refunded by Amazon. Well, this parcel came from Amazon/England. I've written to the carrier they used but have had no response. Normally, out-of-country parcels are delivered to the post office for final delivery so I trust that his was meant when it said "delivered." Lance, the tracking information from amazon.co.uk is very unreliable, and depending on how much time has passed since your order it may still be on its way. I've had a package reported as delivered that came a week later and others that I've received long ago still showing as in transit. But if it has been 2-3 weeks since your order was shipped, you should contact Amazon and let them know. I've found that packages from Amazon in the U.K. can get pretty beat up in shipping as well. I can't fault their service. I get onto 'chat' right away if I have an issue and it's sorted immediately. My set arrived finally. The first one got lost somewhere. It was made right immediately. I have been listening to the remastering and it's a first-class job. Westminster's "natural balance" was right on, and if you didn't know some of these recordings were in mono, you might think otherwise. 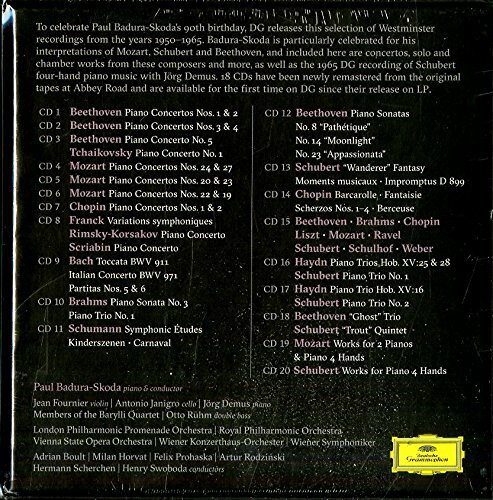 This is a fine set in every respect and it is good to hear Badura-Skoda again in his early recordings. Wow, I can't believe this thread has had over 800 hits.